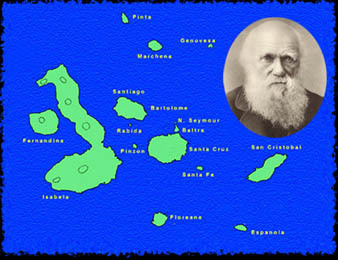 "Another feature in these isles is their emphatic uninhabitableness....Little but reptile life is here found: - tortoises, lizards, immense spiders, snakes, and the strangest anomaly of outlandish Nature, the aguano. No voice, no low, no howl is heard; the chief sound of life here is a hiss." While "immense spiders" certainly are not reptiles, the Galapagos Islands are indeed known for their rich reptilian population, beginning with the giant tortoises, the "galapagos" from which the archipeligo derives its name. It was the giant tortoises, with 11 subspecies scattered about the archipelago, that first called Darwin's attention to the amazing diversity of the Galapagos wildlife. Sea turtles also call the Galapagos home. The most commonly seen sea turtle is the green sea turtle, which is considered to be endangered throughout its range, except in the Galapagos. Lizards are represented by three major types - the iguanas, the lava lizards, and the geckos. The iguanas fall into two basic genera represented by the marine iguana and the land iguana. There are two types of land iguana, usually considered different species, although there are some data to suggest that the two are actually different races of the same species. The lava lizards consist of a single genus, Tropidurus, divided into seven species scattered among most of the islands.Lastly, there are three endemic species of snake.